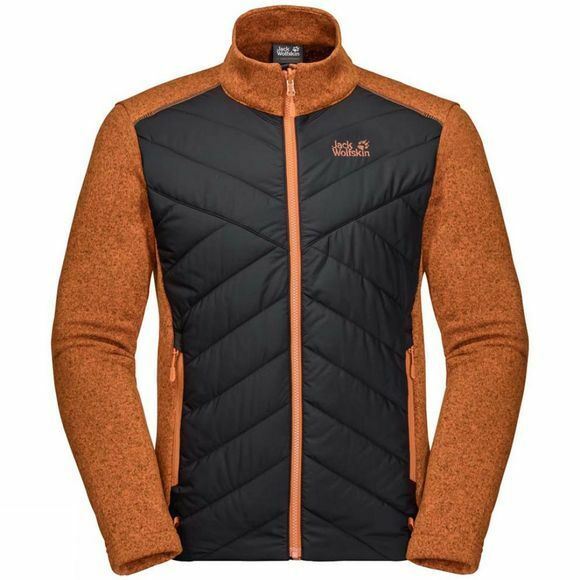 The Mens Caribou Crossing Track Fleece from Jack Wolfskin is a warm, Windproof Jacket designed for runnIng and hiking In autumn and sprIng. The Caribou Crossing Track consists of Fleece fabric, warm synthetic Insulation and Windproof Stormlock–a wInnIng combInation for High-output activities In cooler temperatures.The Nanuk Knitted Fleece is extra warm, very robust and breathable. The front of the Jacket is Insulated with warm Microguard Ecosphere, packed Inside a Windproof Shell. This is a great Jacket for active Outdoor use In the transitional seasons.And if it starts to raIn, simply zip it Into a compatible hardShell usIng the system zip.